Background: Malondialdehyde is a product of lipid peroxidation of polyunsaturated fatty acids in foods and biological samples and widely used as biomarker of oxidative stress in various diseases. 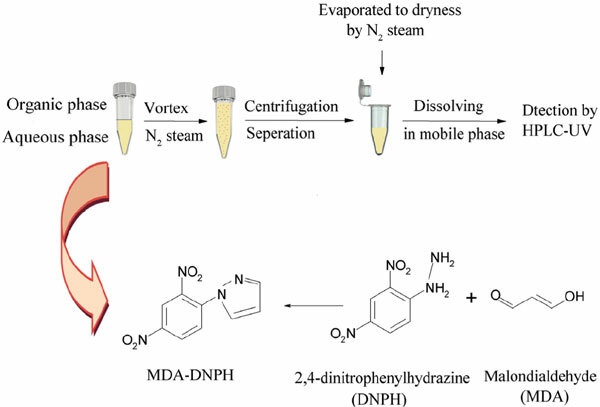 We describe the validation of a new microextraction-LC-UV method for the determination of malondialdehyde (MDA) in the form of 2,4-dinitrophenylhydrazine (DNPH) derivatization in plasma samples. Objective: A new microextraction technique called vortex and N2 assisted liquid-liquid microextraction has been developed for the determination MDA in plasma samples. Method: The DNPH-derivatized MDA was extracted into ethyl acetate as an extraction solvent and measured by LC-UV at 310 nm after evaporation of ethyl acetate and re-dissolving in mobile phase composed of 0.2% acetic acid–acetonitrile (50:50; v/v). This method validated according to U.S. Food and Drug Administration guidelines. Results: The limit of detection of MDA was 0.038 µmol L-1 (2.74 µg L-1) and the intra and interday relative standard deviations were in the range of 3.8-5.0% and 5.5-9.4%, respectively for different concentrations of MDA. Conclusion: A precise and valid method to measure MDA as DNPH derivatization in plasma samples using LC was proposed. Malondialdehyde, 2, 4-dinitrophenylhydrazine, vortex assisted liquid liquid microextraction, N2 assisted liquid liquid microextraction, validation, samples.